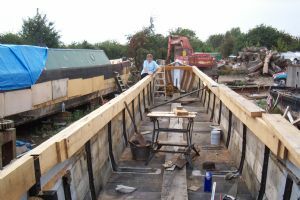 Our wooden narrow boat was completed in 2006. It is 57 feet long and is now moored on our landing stage. Maid of Oak's hull was launched into an icy canal on the 30th of January 2004. A cabin has since been built and the interior fitted out. This shows the hull being built in September 2003.